Housed in a robust metal enclosure, the Ex ES 98 series position switchgear from steute comply with DIN EN 50041 for explosive environments. They will also be suitable for use in zones 1 and 2 (gas Ex) as well as 21 and 22 (dust Ex) in the future. A self-sufficient “Wireless Ex” version is also available. 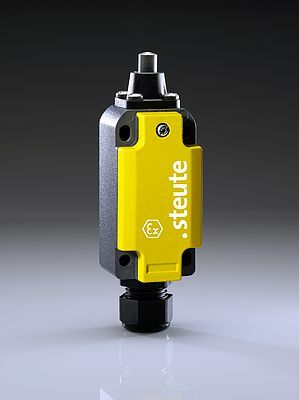 Users can choose from a wide variety of actuators, and the range of switch inserts includes a flame-proof enclosure variant with three contacts, designed as a positive break snap action contact. Additional features include IP 66 to IP 69K protection and -55 to +100°C extended temperature range. Capable of withstanding high degrees of mechanical wear and tear, the devices have high level of corrosion resistance. They are suitable for use in areas, which are cleaned using high-pressure water jets and steam jets. A version for extreme applications without Ex protection standards is also available.